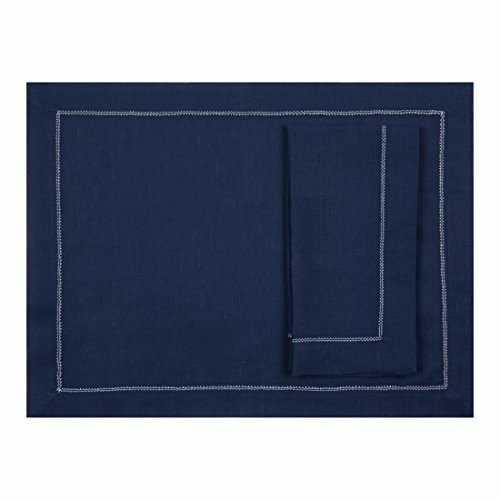 Set of six navy blue pure Italian linen placemats with contrast color hemstitch in ivory. These placemats - 15"x20" - are perfect for formal dining with a unique, timeless flair that is guaranteed to impress the most discerning guests. The ultimate luxury placemat. Machine washable. Made from 100% pure linen sourced from the premier linen mills in Italy, the exquisite fabric gets softer and more beautiful as you wash and use it. These linens will be a favorite part of mealtimes for years to come. Navy blue pure Italian linen placemat with contrast color hemstitch in ivory. These placemats size 15"x20" - are perfect for formal dining with a unique, timeless flair that is guaranteed to impress the most discerning guests. Size: 15"x20". Price is for a set of six placemats the same. Napkins sold separately. If you have any questions about this product by Huddleson Linens, contact us by completing and submitting the form below. If you are looking for a specif part number, please include it with your message.